High peak tent rentals are ideal for graduation parties, birthday parties or any time you are looking for a party tent. High peak tent rental brings a more sophisticated look to your event. They bring the look of a high peak pole tent with the advantages of a frame tent. One of the advantages is no center pole. 50 people for dinner setting. 70 people for chairs only. This tent has an elevated center design with double braced trusses for strength. Seven mouth points per leg. Bolt-on top adds security in windy conditions. Meets CPAI-84 fire resistant requirements. Maximum peak height: 11’ x 2”, maximum headroom: 7’ x 1”, maximum valance clearance height: 6’x 9“. This 10'X15' EZ canopy package is a great, no-fuss outdoor shelter. It is ideal for family parties, weddings, picnics, sports events, outdoor vendors, craft fairs, or any event. And it's a great addition for keeping the sun out of your eyes for our carnival games! This 10'x10' EZ up tent provides instant shelter and protection from the sun and easy to set up. Durable steel frame. It's easy to set up and provides 99% UV protection. Provides 72 sq. ft. of shade. Dimensions 53" long x 8 3/8" wide x 8 3/8" high. ​Our 8x8 Carnival Booth is perfect for community fairs, church events, school carnivals and even carnival themed birthday parties. Use this Carnival tent to put a Carnival Game or Concession Equipment under. Plastic folding chairs are the choice of many event planners for their lightweight design, ease of cleaning, and versatility among events. Constructed of lightweight textured polypropylene and a strong steel frame. 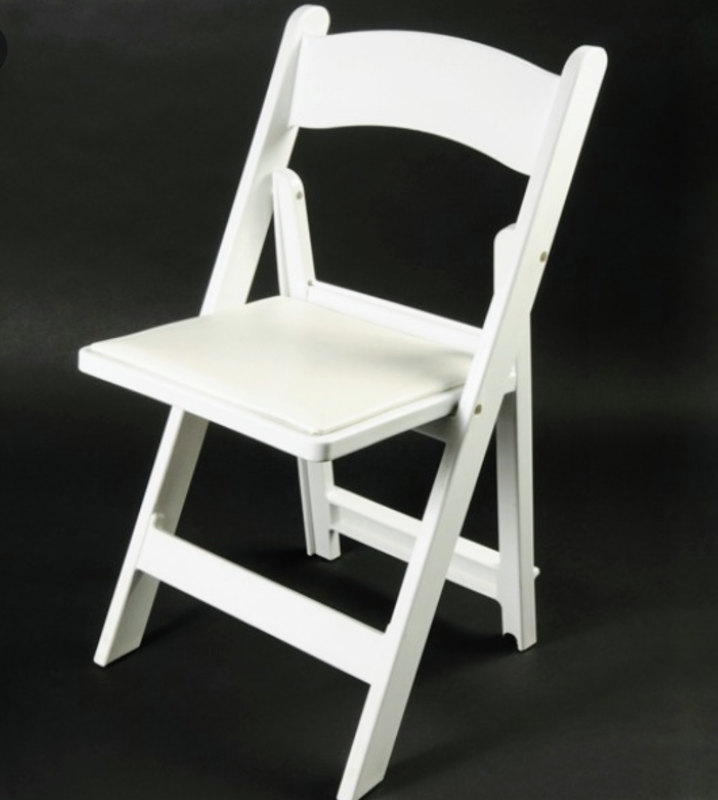 The White Resin Folding Chair combines comfort and elegance that looks good at all your special events, whether it's a backyard barbecue, or a formal banquet. These beautiful white resin folding chairs will make it an event to remember. Provide little ones with a seat specifically designed for them. This Kids Folding Chair will make an exciting addition to any event. The textured seat ensures safe and comfortable seating. ​6' commercial fold-in-half tables are constructed of high-density polyethylene and have a convenient folding design for easy transport and storage. The patented steel frame design provides a sturdy foundation. ​This child sized folding table is perfect for toddlers. Children can enjoy a table of their own for eating, reading, creating and playing. When entertaining large gatherings, kids will have their own dinner place setting. This table can be used in hospitality settings, for designating a special seating area for children at events. 60 inch Round plastic table. Seats up to 8 people comfortably.